Convicted murderer Chris Watts has been moved from a Colorado prison to another prison out of state. DENVER — Convicted murderer Chris Watts has been moved from a Colorado prison to another prison out of state. 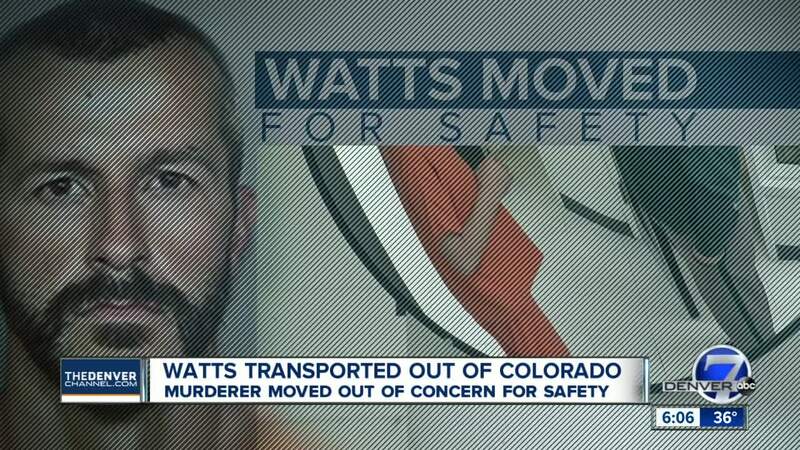 Four sources confirm to Denver7's Jace Larson that Chris Watts was transferred from the Denver Reception and Diagnostic Center, where a new prison inmate goes after conviction, to an undisclosed facility out of state. Victims’ families -- who requested to be alerted -- have been notified, two of the four sources with knowledge of the movement told Denver7. Watts' current location has not been identified, except to victims' families, the source said. Watts pleaded guilty last month to killing his pregnant wife Shanann Watts and their two young daughters at their home in Frederick, Colo. in August. He was sentenced to three consecutive life terms without the possibility of parole. The Colorado Department of Corrections inmate locator shows Watt's location as the Denver Reception and Diagnostic Center, but this is no longer the case. The move occurred as part of an interstate compact where high-profile prisoners can be moved to another state’s system, or occasionally the federal prison system, for safety. Such placements are not always permanent. Moving an inmate out of state is not uncommon. There are 104 Colorado inmates who are being housed out of state, a spokesman for the Colorado Department of Corrections said Tuesday. There are 127 inmates from other states being housed in Colorado. Inmates are not moved to be closer to their families, spokesman Mark Fairbairn said.